Halls Kennel is located near the foothills of the Adirondacks in the St. Lawrence Seaway Valley a little east of Potsdam NY. We have a small farm where we keep our horses, cows, calves, alpacas, pigs, chickens, turkeys, geese, ducks, cats, and of course dogs. We are Christians and our family consists of us, Rob and Emily Hall, and our 11 children, Jessica, Amanda, Robby Joe, Jasmine, Christopher, Paula, Sarah, James, Austin, Benjamin, & Luke. 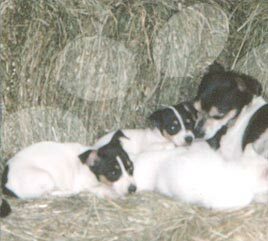 We have owned dogs all our lives and since 1994 we have been raising Rat Terriers as a hobby. 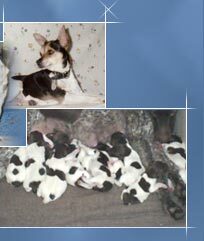 Since then we have expanded our kennel to include German Shorthaired Pointers and Pomeranians. Years ago we raised Pugs for a short while, but decided to discontinue raising them and to concentrate more on our other breeds. 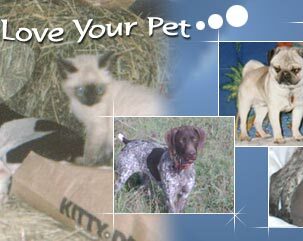 We strive to breed quality dogs with a major emphasis on excellent health, temperament, and conformation. 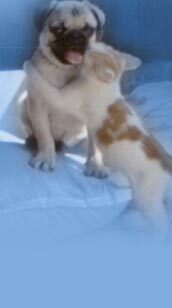 All our puppies are whelped in our house and we make sure all our puppies are socialized from day one. All the puppies we sell come with health and genetic guarantees. Our children are active in the PAWS 4-H club here in St. Lawrence County. The children have fun training and doing projects with their dogs. It's great socializing time for the kids and the dogs. If you are a local family that has kids that love dogs we would love to have you join the club. You don't have to have a purebred dog to join. In fact you are welcome even without a dog! In 2012 we bought Visser Tire LLC in North Lawrence NY where Rob has worked since 2007, so if you need tires at a good price with great service call the shop at 315-389-4486 or stop by at 2043 State Highway 11C, North Lawrence, NY 12967! www.vissertire.com . Please note that our tire shop location is not the same as our home/kennel location. ï¿½ Copyright 2004, Halls Kennel. All Rights Reserved.